Structured XML Editing - The most intuitive XML editing features and a user-friendly interface, helping you to improve the results of your work with oXygen XML Editor. 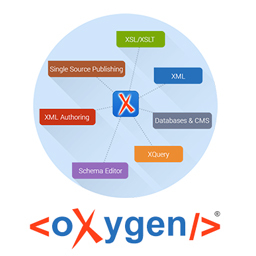 All XML Standards Support - Take advantage of the dedicated editors that oXygen XML Editor offers, covering all XML standards. The specialized views and operations of each editor offer support to edit XML Schemas, XSLT stylesheets, WSDL, RelaxNG, and XQuery files.